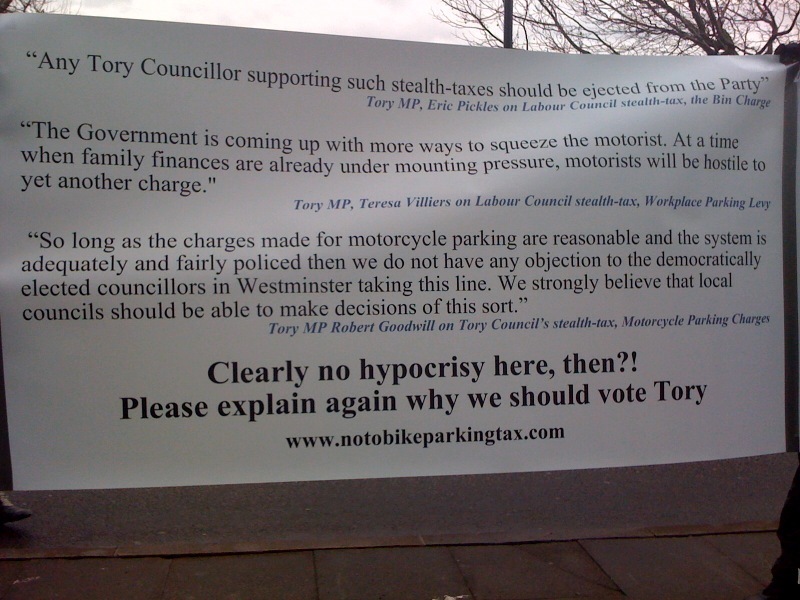 Why should motorcyclists vote Conservative at the 2010 general elections? Central London was today the scene of another spectacular demonstration against the stealth tax introduced by Conservative lead Westminster City Council on motorcycle parking. A tax that has absolutely no justification whatsoever other than that of making its architects (Councillor Danny Chalkley, Kevin Goad and Alastair Gilchrist) wealthier and more arrogant than they already are. Prior to the event, hundreds of bikers registered on the No To Bike Parking Tax campaign website to be notified by SMS or email of the meeting point thirty minutes before the start of the demonstration. 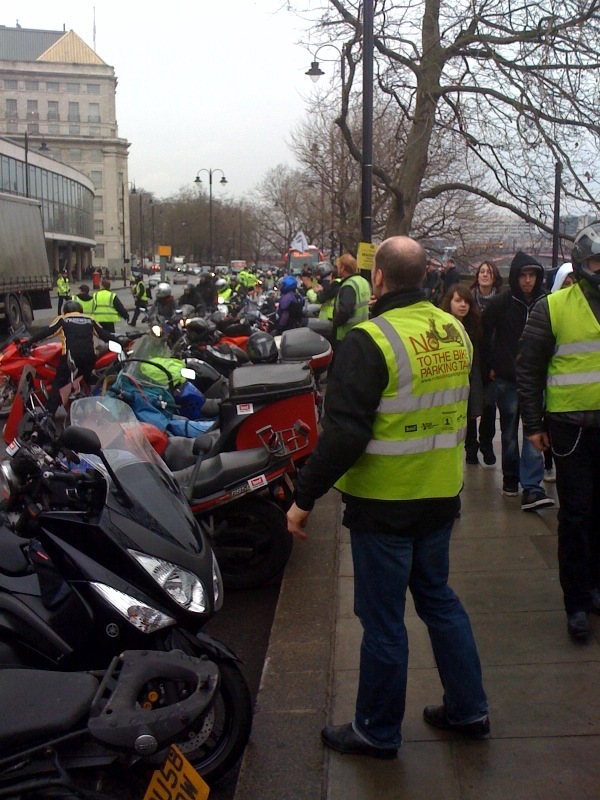 The same hundreds of motorcyclists all gathered in Trafalgar Square at 1pm in a carnaval atmosphere, making an incredible amount of noise with their horns and causing an enormous traffic jam all over the square and its surroundings. 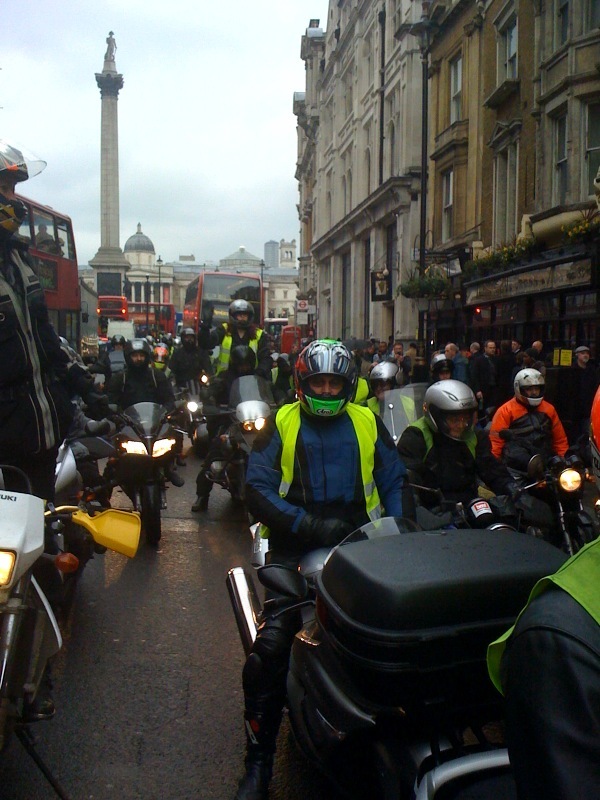 As we approached Trafalgar Square, we were delighted to see a very good turn out, which showed how angry bikers are at a group of Westminster Conservatives for having imposed on them, without proper consultation and justification, a punishing stealth tax to purely fill up their pockets. We were amused by the idea of receiving an SMS to advise the demonstration’s meeting point, when Westminster Council’s charging method for parking is precisely by SMS, via their pay by phone Canadian based supplier, Verrus. Unlike the crappy Verrus system, which keeps breaking down all the time and leaving its users in distress in the pouring rain or freezing temperatures, the operator used by the No To Bike Parking Tax campaign to send all these SMS messages was absolutely first class. Everyone received their SMS as scheduled, which caused no delays, stress and irritation. What a nice change compared with this horrible Verrus system, which is everything but user friendly and reliable! At 1.20pm, protestors left Traflagar Square for Millbank to gather outside the Tory Headquaters to ask David Cameron, Leader of the Conservative Party, one simple question (which has yet to be answered): why should motorcyclists vote Tory at the forthcoming general elections? Eh, why, tell us why, we are all dying to know what benefits we, as motorcyclists, will get from a Tory Government. David Cameron has many times avised the UK population that, if elected, his party will not introduce stealth taxes and will also scrap unnecessary stealth taxes. But he seems to have no issues with letting his “local boys” in Conservative lead councils, such as Westminster, introduce a stealth tax on motorcycle parking, when bikes are the golden transport solution to relieve congestion, reduce pollution and offer a cheaper mode of transport for those in a less comfortable financial position. 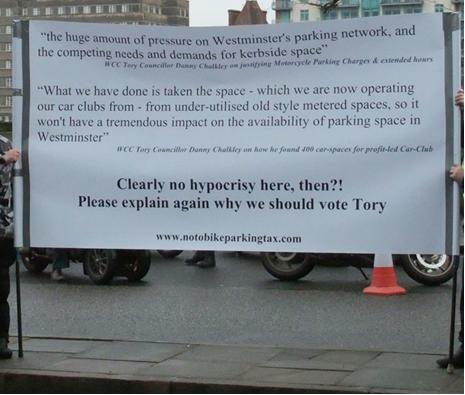 David Cameron, while saying that he is against stealth taxes, has done absolutely NOTHING whatsoever for this ridiculous motorcycle parking tax in Westminster to be scrapped, despite the thousands of objections that Westminster Council received during the experimental period. Cameron, and the Tory Grandees in general, have not moved their arse one single time to put pressure on a council managed by members of their own party to ask them to scrap a highly unpopular stealth tax, which brings in millions of pounds per annum, at a time when a large proportion of UK citizens are struggling to keep their job and feed their families. Why so much hypocrisy, Mr Cameron? Why do you keep saying that your political party is against stealth taxes when we have here a perfect example that suggests otherwise? Why should we be tempted to vote Conservative at the fast approaching general elections, when the opinion and objections of thousands of UK citizens have been totally ignored by your local representatives? Anyway, the fight against the motorcycle parking tax imposed by a bunch of hypocrit Conservative bureaucrats continues! Finally a proper demonstration, a new breed of angry citizens was born today, bikers, motorists, bus drivers, taxi drivers, members of the public, retailers, theatres,100% support against Westminster city council crazy parking racket. This is the start of a new generation of demonstrations, and there is better and more to come I’m sure of this. Westminster is not going to be seen as the flagship conservative borough any longer, too much bad publicity, too much corruption, too many lies, mind, they had very good training from lady S.Porter haven’t they ? Westminster council has too may skeletons in its cupboards and they are comming out for all to see ! Why is the tory party scared of Westminster city hall ? Excellent write up of the days events. I think Westminster Council have changed from a flagship borough to the prime target for exposing the corrupt parking industry we have now. If we can topple Westminster the rest will fall. Funny how it took those people who ride on two wheels to do it, are they only ones who can see what’s been going on? Les ‘manifs’ hier à Trafalgar Square et après en face des bureaux de parti politique conservateur a montrer la hypocrasie de politique en Angleterre et les ‘politicards’ ils ont peur de rencontre le ‘populo’ et les ‘prolos’. Le chef du parti conservateur, David Cameron, a dit dans son ‘pub’ “Je ne introduirai pas les impôts furtivements………” (Il veut le boulot de premier ministre de Grande Bretagne) mais le conseil municipal de westminster (conservateur) a déja mettre un taxe sur le parking des motos. Il a fait rien à changer cet loi locale pendant dix-huit mois. Personne n’est pas sorti des bureaux à donner un réponse de cette question aux cinq cent motocyclistes. L’abréviation du parti conservateur normalement utilisé c’est “Con” (en anglais un escroc peut-être !) mais je pense que le mot “Con” en français est aussi juste pour ce ‘mec’ ! Il me semble que maintenant ça barde. Comment se fait il que les motards anglais tolerent cette taxe ? Ailleurs, il y aurait eu une revolution ! Ne vous laissez plus faire, agissez vite et bien. Thanks very much all for your comments. It is very clear that this bike parking tax is totally inconsistent with the policy of the Conservative Party which, according to David Cameron, consists of scrapping unnecessary stealth taxes and not introduce new ones. If this tax was supported with valid and robust reasons, then why not, but the fact is that it’s totally unjustified, it’s nothing but an attempt by a Conservative member to raise revenue out of motorcyclists, who have delibarately chosen a mode of transport that doesn’t congest and pollute a lot less than four wheel vehicles. We are not saying “don’t vote Conservative at the forthcoming general elections”, but ask yourself why you should vote Conservative, given that we have a clear example of a member of the Conservative Party who has introduced a stealth tax which is against the Party’s policy and which David Cameron has not done anything at all to get scrapped, despite saying that his party is against stealth taxes. This sounds like pure hypocrisy and we think an explanation from David Cameron is required, especially in the run up to the general elections. Merci beaucoup pour vos commentaires. Il est clair que cette taxe de stationnement des deux roues motorises est totalement incoherente avec la politique du parti conservateur britannique. David Cameron (leader du parti conservateur) s’est engage a supprimer les taxes et a ne pas en introduire de nouvelles. Si cette taxe etait justifiee par des arguments convaincants et coherents, soit, mais elle s’avere totalement injustifiee et n’a pour but que de generer du revenu sur le dos des motocyclistes, qui ont choisi un mode de transport qui n’embouteille pas et pollue bien moins que les vehicules a quatre roues. En aucun cas conseillons-nous aux electeurs britanniques de ne pas voter conservateur, mais nous leur demandons de reflechir aux raisons pour lesquelles ils choisiraient de voter pour ce parti aux elections de 2010, sachant que nous avons ici un exemple d’un membre du parti qui a introduit une taxe qui va a l’encontre de la politique du ditparti et pour laquelle David Cameron n’a pas pris l’initiative de supprimer. Ceci est le reflet pur et simple d’un parti compose d’hypocrites et nous pensons qu’une explication de la part de David Cameron serait de rigueur, surtout en cette periode de campagne electorale. I work in the HGV industry and although we are a different breed to you Bikers, the Conservatives want to stealth tax us too. I know which way I am voting. The way fuel prices are going no one can afford to go out anyway! HGV Training you should follow the example of our french neighbours & demonstrate. As perhaps the NoToBikeParkingTax has clearly shown intelligent & effective protest doesn’t necessarily require thousands of sympathisers. It requires belief in your cause & tenacity. if there is a bikers protest in north east essex, i may be able to get the support of our MP Douglas Carswell. if you can arrange a run to walton on the naze or clacton, i may be able to get our MP to make a speach or even ride along with us..
he does support bikes and it was mine he is riding on his web site. please feel free to call me on 01255 436378.
ride safe and ride free, gab. if you can arrange a run to walton on the naze or clacton, i may be able to get our MP to make a speech or even ride along with us.